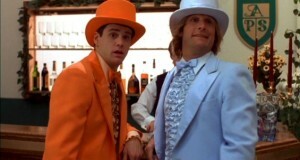 Jim Carrey and Jeff Daniels Are Back for ‘Dumb and Dumber 2’!!! We’ve reported before about an impending ‘Dumb and Dumber’ sequel that would bring back Jim Carrey and Jeff Daniels to reprise their iconic Harry and Lloyd roles. You can read our coverage HERE. At a press junket today with Peter Farrelly for his upcoming ‘Three Stooges’ film, he said that ‘Dumb and Dumber 2’ is definitely coming and is even set to start shooting this year according to ComingSoon. I consider ‘Dumb and Dumber’ one of the funnier films of the past 50 years and I believe this film definitely deserves a sequel. This entry was posted on Monday, April 2nd, 2012 at 2:59 pm	and is filed under Film, News. You can follow any responses to this entry through the RSS 2.0 feed. You can skip to the end and leave a response. Pinging is currently not allowed. « James Cameron Says He Wants to Make a Sequel to ‘Prometheus’!! !